Dishes cooked on an open fire are rightfully considered to be one of the most delicious, so it is not surprising that the people of Asia skillfully took advantage of this and created an amazing tandoor roasting oven. Like many centuries ago, it is commonly used to prepare dishes of Caucasian and Indian cuisine, but today everyone can feel the delicious taste and aroma of bread cakes, meat, fish or vegetables by purchasing or building their own tandoor. 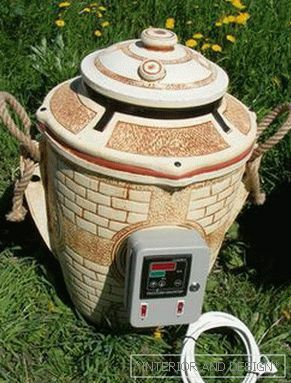 And how to do it and in general, what constitutes this oriental ceramic furnace, we are happy to tell in this article. Originally called tandyr clay portable hearthwho was taken to the campaign by nomadic tribes. Most often, it was used to prepare pita bread, and only when there was an opportunity - meat and vegetables. At the expiration of time and with the appearance of sedentary tribes, the tandoor acquired more massive dimensions and began to be placed in a stationary way. in order to ensure uniform roasting tandoor cover with a lid. 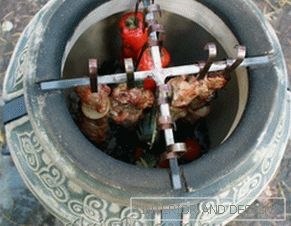 The food is prepared in a tandoor very quickly, but, despite this, all the dishes are very juicy and fragrant. The fact is that the tightness of the structure, as well as the ability to maintain the same temperature during the whole cooking period, prevents the products from drying. Bread is prepared by fixing the cakes on the inner walls. Meat is best cooked on skewers, which are suspended in an upright position. Fish and vegetables laid on metal grillinserted inside and secured with special holders. Furnaces with portable (mobile) placement. 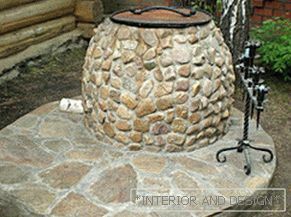 Stationary stoves have more significant dimensions, have the shape of a hemisphere, and their diameter is within one meter. Made of ceramic bricks and clay. Such tandoors often build their own hands. They can be both with horizontal and vertical axis arrangement. The first ones are intended only for baking bread, and the second ones are for absolutely any dishes, in particular kebabs, samsa, bread cakes, fish, and vegetables etc. Cooked out food with long hooks or buckets with a handle. 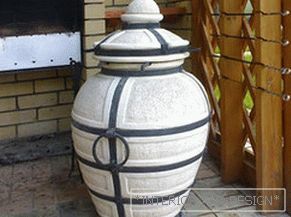 The main advantage of such tandoors in comparison with the same brick grill can be called not only the taste of dishes, but also the saving of firewood for the firebox by 2–3 times. 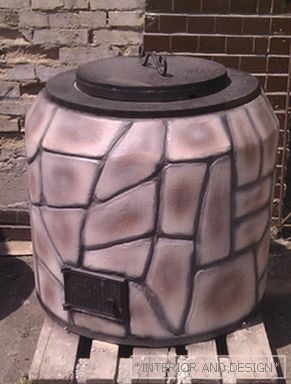 Mobile tandyr - This is a modern interpretation of the first furnaces of this kind, which are sold in ready-made form. They are made of chamotte clay with a wall thickness from 3 to 7 cm. They have much smaller dimensions in comparison with stationary structures. To improve the properties of the additional applied outer layer of insulating material. Decorated in an interesting design with common features, namely the presence forged items in the form of handles and rims. 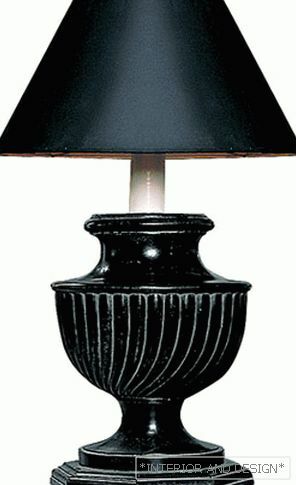 Externally, quite strongly resemble a vase or urn. A more modern design allows the skewer to be installed in an upright position, as well as to insert a grate, which is usually included in the oven kit. Below there is a blower with a metal cover. In addition to the above types, there is also an option that can be used right in the house in your favorite kitchen. We are talking about electric tandoorare in high demand among residents of multi-storey buildings who do not have the opportunity to come to their dacha and enjoy the dishes prepared in this oriental stove. 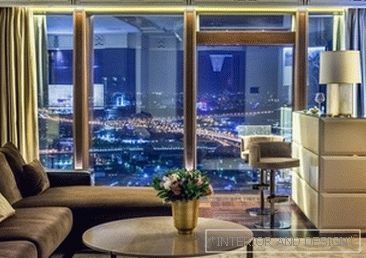 Of course, it would be silly to talk about similar taste characteristics of dishes cooked in wood-burning ovens and stoves with a built-in electric heater, since the heating element in any case dries up air and does not give the desired flavor. But, it should be noted that there are high tech electric tandoors, the cost of which is unlikely to attract the average resident of our country. Such equipment is equipped with an on-board computer, additional thermal insulation of the clay material, a special nano-device that moistens the air in the chamber in portions and other results of scientific and technological progress. Preparation of the base. 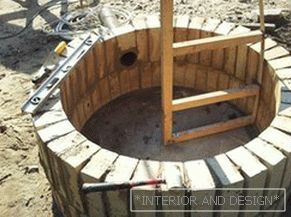 It is necessary to properly pour the foundation, for which a hole is dug sized to be identical with the diameter of the tandoor. Then, to increase the strength of the base, a steel grid is inserted inside and the foundation is poured. At the end of the drying period, which usually lasts about 1-2 weeks, proceed to the masonry. Bricklaying. The diameter of the tandoor is about 1 m, so before you start laying the first brick row it is recommended to outline the exact outlines of the future furnace. Cement mortar is diluted in a ratio of 1: 3, and the brick is laid in an upright position. Laying the first row should leave a holewhich will play the role of the blew. After laying the three rows, the circles gradually begin to narrow until the neck is half a meter in diameter. This effect can be achieved by adjusting the level of tilt bricks by changing the thickness of the cement mortar layer, or you can use a brick, trimmed with a grinder. Chamotte Claying. After the brickwork is completed, the inner and outer walls of the tandoor are to be coated with a thick layer of chamotte clay. Some lovers of folk traditions add sheep wool to the clay solution. Obscene Ears. Once all the results of previous work are dry, you can start the burning process, which implies moderate heating the stove with a small batch of firewood. 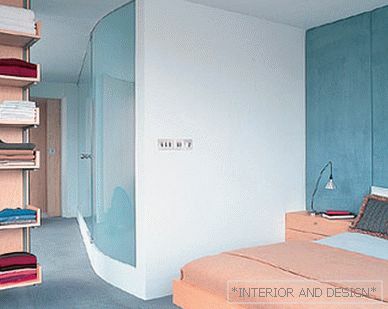 Decorative trim and an increase in thermal insulation properties. In order for our tandyr to accumulate heat even better, it is necessary to increase its thermal insulation properties. For this most often used a natural stonewhich lay the outer walls of the tandoor. Such a finish will not only contribute to a slower cooling of the furnace, but will better decorate it. You can also make a double masonry, and fill the space between the brick rows with expanded clay. Do not forget about the lid for the tandoor itself and blew it. The construction of a tandyr with their own hands at the dacha at first glance seems to be a rather simple idea, and this is generally true, except for one “but”, namely, working with clay, which is considered to be one of the most sensitive materials. Therefore, armed with patience, you just have to, as the pottery, even in such a seemingly simple form, requires a gentle and careful approach to yourself. The main thing is to start working with the idea that very soon you and your family will be able to experience the unforgettable taste and aroma of dishes cooked in this wonderful oven called tandoor.